Cairns Taxis Limited (formally known as – Black and White (Quick Service) Taxis Ltd) was born 52 years ago when two local firms, Blue and White Taxis and Black and White Taxis combined to create a fleet of 21 cars. In 1966, Cairns had four other taxi companies – Yellow Cabs, Ace Taxis, Sunshine Taxis and Star Taxis. Today the Cairns Taxi’s fleet consist of 137 Taxis that operate 24/7. Black and White Taxis changed its name to Cairns Taxis Limited in 2011 and continues to be a leader in the taxi industry. Cairns Taxis continues to be innovative and introduce new and updated technology as it strives for continual improvement and efficiency for the benefit of the Cairns Community. Taxi operations originally were located beside the Hides Hotel with an aerial fitted to the hotel roof, base operations back then were more than adequate for the growing town, with a PBAX switchboard with five lines and 92 extensions for the free taxi phones. Unfortunately the building was demolished to make way for the Hides Motel, and a new premise was leased in 1967 in the new Andrejics Arcade. The cost to relocate was substantial, and the expense was offset by a agreement with Esso Australia for the purchase of fuel. During 1968 fare meters were introduced to the Cairns fleet and at this time, the flag fall was 27 cents and the telephone booking surcharge was 10 cents. In 1972 Caltex Australia offered the company premises at 161 Sheridan street behind the Tropical Star Service Station. This was gratefully accepted and become the taxi home for 13 years. The company was now able to offer and sell fuel to its shareholders, the taxi fleet. During the period 1967 to 1985, the other taxis companies in the area were slowly amalgamated with Black and White Taxis. In 1975, the last three taxis of Sunshine Taxis joined the Black and White organisation. In 1980 the Department of Transport expanded the taxi service area to include the Northern Beaches and Machans Beach Taxi joined the expanding organisation. In 1985 the Department once again expanded the taxi boundaries to include Edmonton and Edmonton Taxi Service also merged with the growing company. At present Cairns Taxis now services an area as far south as Wright’s Creek, as far north to Simpson Point, and as far west as the Henry Ross Lookout. In 1985 the company purchased premises at 16 Palm Avenue, heralded as a major step forward by members as it was their first solid foundation in the Cairns area. Cairns expanded rapidly that year, and the BP service Station in Sheridan street was purchased and renovated as a headquarters to cater for further expansion. Black and White Taxis remained in at the forefront of innovation with a computerised dispatch system in 1989, in 1990 a global positioning system dispatch was implemented. Black and White continued to be innovative and was the first taxi company in Australia to introduce airport supervisors and rank security to ensure efficient service during peak times. The ambitious company then went on to build and operate the Shell Cairns South Service Station in Woree and constructed the Bob Jane T-mart building beside the service station. Black and White Taxis sold off all its holdings slowly, so it could focus its efforts on maintaining and servicing the Cairns community with an efficient taxi service. Cairns Taxis now operates 137 taxis and has over 450 full time and part time drivers associated with the organisation, these have been trained and accredited by the company in order to maintain a reliable 24 hour service. A further support staff of 34 employees assist in the company’s operations. 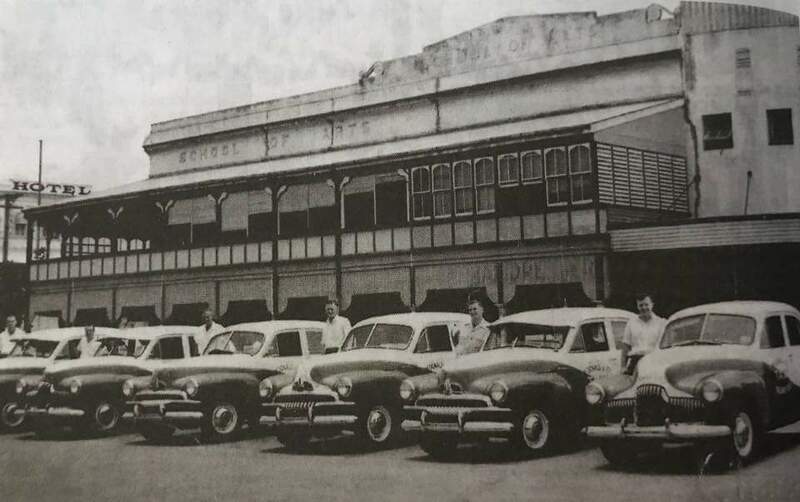 Currently the companies investment in the Cairns Region, including taxi licences, is in excess of $70 Million – a far cry from the fledgling company 52 years ago. In 2000 / 2001 Black and White purchased and moved to its current base of operations, 16 Comport St, where it renovated the building to make it suitable for a 24 hour call centre and radio communication base. Cairns Taxis has operated in Cairns for many years and is, in essence, not one entity, but a co-operative of taxi owners and affiliated drivers. Each Taxi owner either leases out their vehicle, or they drive themselves. Cairns Taxis Limited continues to provide the administrative and logistical support to the owners and drivers that make up the Cairns Taxis fleet. The vast majority of owners are Cairns people so in a sense it is truly a Cairns-owned and operated company. Cairns Taxis is recognised as the leading taxi company in Australia, with policies such as dress standards and the companies code of ethics was adopted by the State of Victoria. Cairns Taxis has operating procedures that have been replicated in many other cities and regional areas. Cairns Taxis strives to be the leaders of the future in an exciting and changing industry.